I love mountaineering but I hate it when my pants get stuck in my legs because of the cold and snow. Thankfully, there are moisture-wicking mountaineering pants. You can find a number of pants in a different size, style, and texture that are available for men as well as women mountaineers. These pants ensure proper insulation in your body as you begin walking in the mountainous terrains. Along with warmth, these pants are adjustable, flexible, and weather-resistant to give you to a new level of adventure in the mountains. I love soft shell pants. But, I have tried many pants available in the market to find the best mountaineering pants that promise warm and comfortable mountaineering. 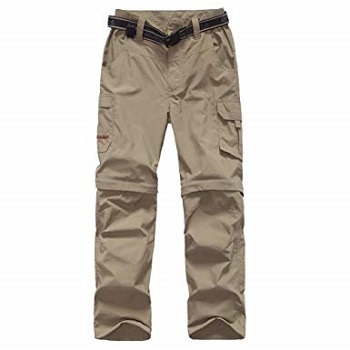 The moutaineering pants from 1 to 5 are for men and 6 to 10 are for women. Click here to jump to women pants. How to Choose the Best Pant for Mountaineering? 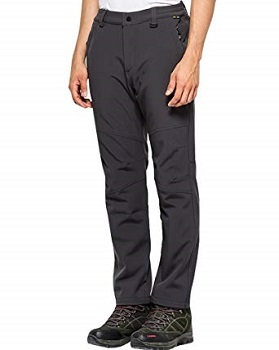 Outdoor ventures Men’s mountaineering pants are among the comfortable pants for mountaineering because they are made of stretchable fabric that is super comfortable while moving. The dart on knee adds more flexibility to you especially as you descend along the mountain trails. The pant is made of 94% polyester and 6% spandex and is available in four different colors- Black, Grey, Dark Khaki, Navy. Along with the fabric and the color, the pant has 100% polyester lining which makes it durable. This machine washable pant entails three layers of which the outer shell is water-proof while the middle layer makes it wind-proof. The innermost layer contains warm fleece that maintains as well as shields body heat. These are the customizable pants where you can adjust the waist and belt using the velcro and loops. Plus, these pants are made up of stretchable fabrics with darted knees. So, these pants are a great option for comfort to the mountaineers with varying body size. It is different from other pants due to its reflective zipper puller on the security pockets on side and back. Along with the secured pocket, the pant has a warm pocket lining which prevents heat leakage from the body even when the zipper is open. 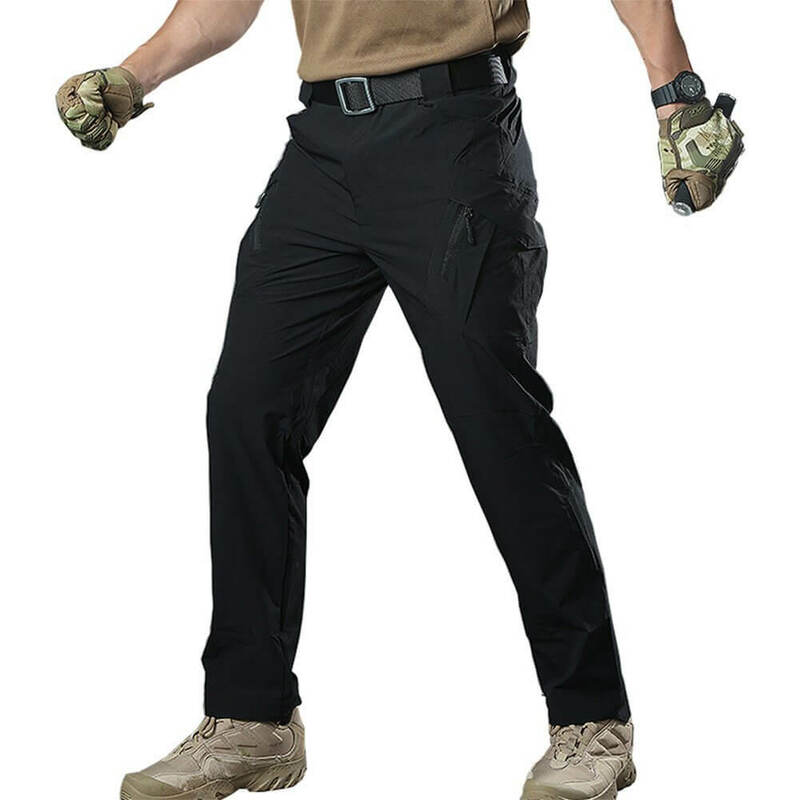 Available in three different colors- Khaki, black, Army Green, these pants are great mountaineering pants for men because they are lightweight, durable, breathable, and super comfortable. These are the durable convertible pants that have zip-closure security pockets and side pockets that ensure the safety of your small belongings. It also has a mesh pocket bags for ultimate convenience and efficiency. Plus, the construction of hook and loop closure adds more security to your handy gears. The pant contains partial elastic waist which makes it comfortable for you to adjust it according to your body size. Plus, the gusset detail and zip in the bottom of the pant add more comfort while putting and taking off the pant. Along with comfort, these pants have nylon taslon fabric which gives you protection against the burning sun in the mountains whereas, the Omni-wick technology keeps you dry keeping away the moisture away from the body. Tacvasen mountaineering pants are the polyester-made stretchable pants that ensure great flexibility to the Mountaineers. Along with the fabric, these pants contain stretchy waist belt which allows mountaineers to adjust the pant as per their waist size and comfort. 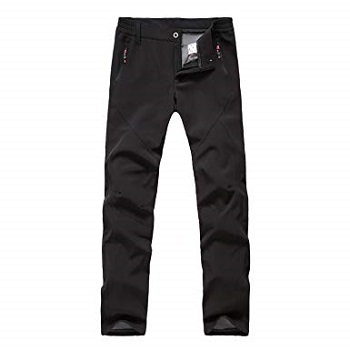 Unique among other mountaineering pants, these pants feature strengthened knee with 3D tailoring which makes it durable. Unlike other bulky pants, they are lightweight and thin so you will have a quite easy time while moving on the mountain trails. While talking about the fabrics, these pants are made of breathable fabrics that are water-resistant and windproof. Alongside, these pants are quick drying and offer the UV-protection. So, you can walk comfortably in the snow as well as in scorching sun in the high altitudes. Also, these pants have multiple water-proof zippered pockets which maintain the safety of your things by keeping them dry inside the pocket. You can find a number of color options while getting these pants. It includes Khaki, Black, Army Green, and Grey. With the color variation, you will look different from others in the group while mountaineering. These are the stylish pants that possess slimming European cut while being lightweight and comfortable. These pants are available in multiple sizes to fit in different body type of the Mountaineers. Plus, the deep pockets in these pants keep your light belongings safe without being worried about their safety. These pants are made of non-elastic moisture-wicking fabric that is wind as well as water-proof. While keeping you warm, these pants have polar fleece that has soft skin touch which makes you feel comfortable on your walks. So, with these pants on, you can walk to any type of weather conditions and the dense snow. Basically, these pants have polyester in the outer shell which promises to lock heat inside the pant. So, these warm, comfortable, and hardshell pants could be the pant for your next adventure in the mountains. 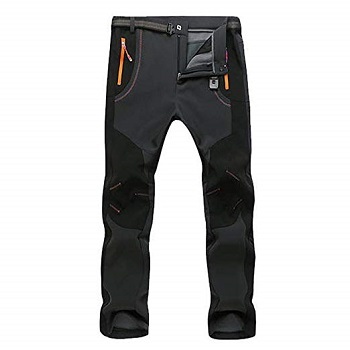 Gash Hao Mens mountaineering pants are the adjustable mountaineering pants for men. These pants are available in two colors ie black and grey. So, you have the option to pick the color choices depending on your preference. The good thing about these pants is they fit any body size with the adjustable and stretchy waist. Such a feature helps you to move or walk comfortably in any type of terrain. Along with this, these pants feature granule fleece which gives extra warmth as well as insulation during your walks in the snow. These are the breathable, waterproof as well as windproof pants with quick drying fabric. That means, with these pants on, you can remain warm and dry in any weather condition. Plus, the zippered bottom prevents snow or cold from entering inside the pant. This is the added feature of these pants as it locks the air inside the pant to maintain warmth. Along with comfort, these pants also ensure the safety of your minor necessaries like chocolate bars, maps, watch, etc. This is possible because of the availability of two zippered side-pocket and a hidden pocket at the back. With so many features, these are quite lightweight and appear less bulky. So, this is among the mountaineers choice. This is among the popular pants many mountaineers prefer. This is because of the fabric it incorporates. The pant combines together three different layers- the outer shell, the middle fabric, and the inner. The outer shell is made of a water-resistant fabric while the middle layer is windproof. And, the innermost layer has a fixed fleece inside that keeps you warm even in the coldest temperatures. These pants come in four different color- black, dark blue, purple melange, grey. With all these colors, you can find the zippered bottom which helps you to put on and put off your mountaineering shoes during intervals. But, in the black color, you have two types of pant: one that has a zipper in the bottom while the other looks like a normal pant. Along with it, this pant also has two zippered security pocket where you can put your accessories that you need quite often. While buying these pants, you need not worry about your waist size because these pants have adjustable velcro to fit the pant properly on your waist. 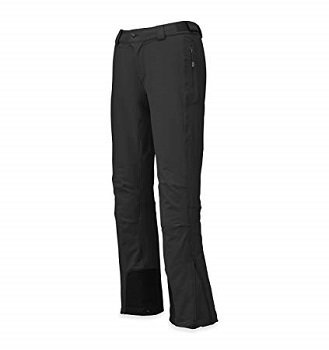 Women fleece lined mountaineering pants are the best softshell pants available in the market. 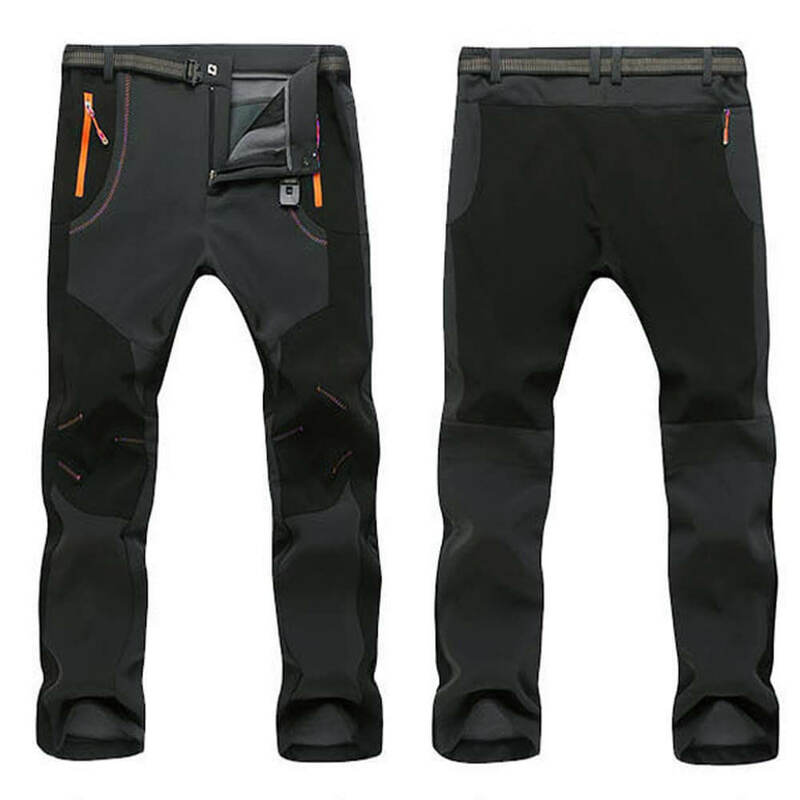 These polyester made pants with the windproof and waterproof feature along with a warm fleece inside could be the best option for mountaineering. Typically designed for the female mountaineers, these pants promise added comfort to the Mountaineers with the side elastic waist and belt loops. Also, these pants are super comfortable that eases your leg and body movement while making you look fashionable in the mountains. These pants are made of Polyester with warm fleece inside. This promises warmth, comfort, and flexibility when you are walking in the mountains. 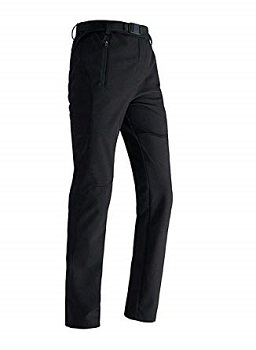 You can walk freely on these moisture-wicking pants without having to worry about catching a cold in the mountains. While on these pants, you can easily put your mobile phones, snacks, compass, maps in the two zippered hand pocket. You handy belongings remain secure in those zippered pockets. Most of the pants designed for mountaineering are usually weighty and thick because of the fabrics and the inner fleece. But, as an exception, this pant is quite lightweight and thin, however, does the best work to keep you warm and comfortable in mountains. 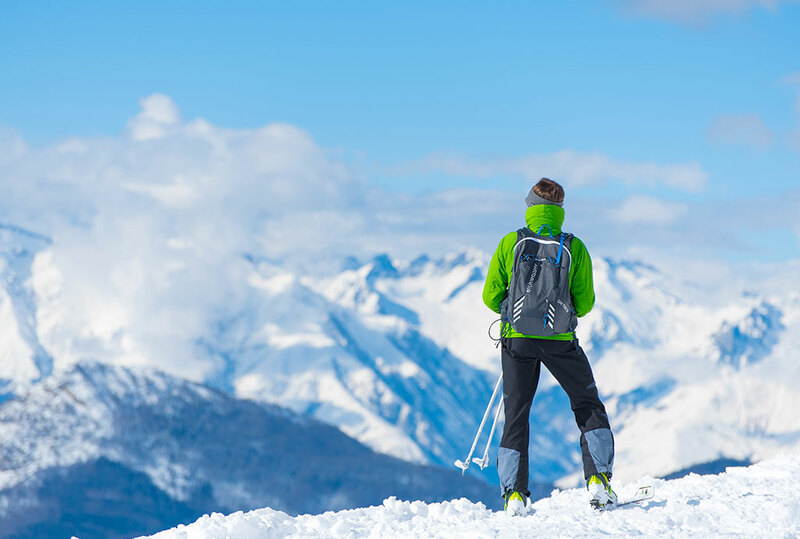 The three-layered Jomlun mountaineering pant offers the comfort, warmth as well as protection in the snow. The pant’s outer layer is made of water-proof and wind-resistant fabric that offers breathability to the pant. While the inner middle contains a high-end fiber and the inner a polar fleece that offers warmth in the harsh weather conditions. These pants have a stretchy waist which can be adjusted to any body type. This feature eases movement in different topographical conditions. Along with the comfort and warmth, these pants are wear and tear as well as tensile resistant with the high elongation. 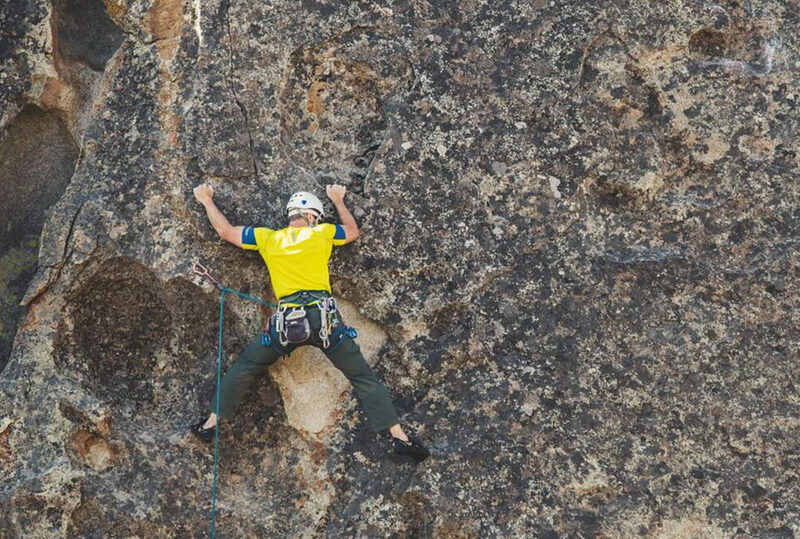 These features add durability to your mountaineering pants. So, you can use these pants for a number of times. Containing zippered pockets, these pants are available in 6 different color options. They are black, purple, light tan, Khaki, gray, wine red. This is a softshell pant for women that suits best for mountaineering, ice climbing, and trekking. These are the insulating as well as durable pants that you can use multiple times after buying one without having to compromise on quality and comfort. 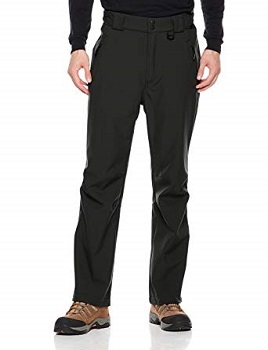 These pants are highly breathable which keep you warm and dry at the same time despite having to walk in the snow or cold. Plus, the double-weave stretch fabric makes these pant weather as well as wind-resistant. These heavy-weight pants are abrasion-resistant and movement-stretching which makes it safe as well as comfortable in long walks. Along with the insulating fabric, the pant also has a zippered thigh pocket where you can easily keep your light snacks, cell phones, maps, and other light essentials. Furthermore, the pant has adjustable tabs at the waist so the mountaineer with a different body size can customize the pant. You can hold the pant easily on your body with the help of the belt loops and buttons. Plus, the availability of articulated knee and zipper fly makes this pant extra as well as comfortable than other mountaineering pants. 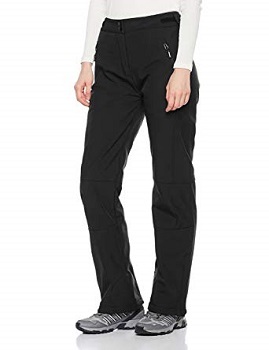 These are popular stretchable mountaineering pants for women which offer great comfort as well as warmth in ice, snow, or in rain. This is possible with the polar fleece that has a moisture-wicking fabric inside the 100% polyester shell. A peculiar quality of this pant is its dirt-resistant feature which keeps it clean after multiple usages. Also, these softshell pants are elastic in nature so fits in any body type without any deformation nor the balls in the outer shell. And, you can customize these pants to any waist size with the help of the elastic waist and belt loops. The pants are available in two different color- black and grey with two zippered hand pockets. On these pockets, you can easily keep some light stuff you need often during the trek. Along with comfort, these pants also make you look fashionable while walking in the snow. These pants provide full weather protection. These pants are waterproof/ windproof and breathable. 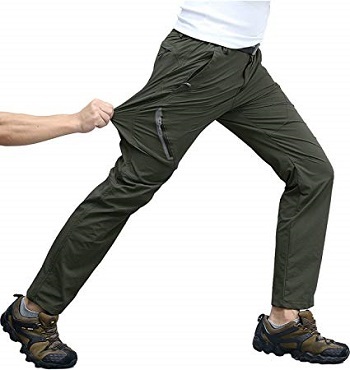 These pants keep you dry in the snow and in mountains. They are more suitable for extreme conditions. They are highly breathable and soft that eases movement. These pants are usually made of high-performance fibers that are tear and wear resistant. These quick-drying pants are typically water-resistant which shades light rain. They are more breathable and lightweight which you can use anywhere. This is the most important feature that the pants designed for outdoors should have. As you are traveling to a cold area or mountains you will be exposed to the cold surrounding. The cold may affect your journey. So, it is always a safe idea to buy a windproof pant. Such pants keep you warm even in the coldest and dropping temperatures. Check out those pants that allow sufficient airflow to keep your body dry despite the sweat or rain. You should also look for the one that soaks moisture and one that allows the body sweat and moisture to evaporate. Walking high in the mountain means you will have to bear the uneven weather conditions. Also, while mountaineering you will walk in the snow for many days. The snow may moisten your pants and you may catch a cold. For this reason, you need to get water-resistant pants which stops the moisture from entering your pant to the body. 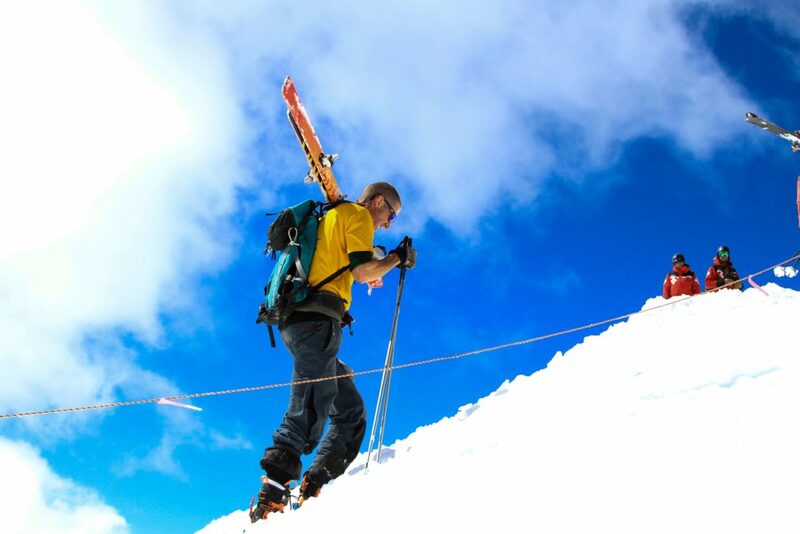 Before you buy one, you should make sure that your mountaineering pant is lightweight. A bumpy pant may keep you warm but it increases discomfort while on your walks. With a heavy pant, your normal walking may be disturbed and it may affect your movement. However, a lightweight pant helps to balance your body in any situation. Besides these, you need to look for some other features as well while buying a pant for mountaineering. 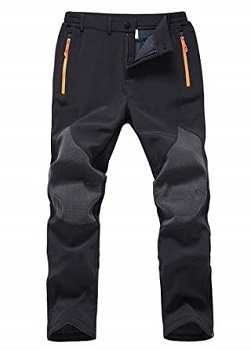 You need to look for the durability of the pant, the number of pockets (with or without zipper), adjustable belts with a loop, enhancement in knees and flexible. Also, do not forget to check if it is abrasion-resistant because you do not want to buy a new pant every time you go mountaineering, do you? So, along with the quality and comfort, also look for the durability of the pant. I’ve reviewed these mountaineering pants that vary from each other in many aspects like weight, stretchability, fabric, and comfort. So, you may have a difficult time choosing one that suits you high in the mountains. Before you buy one, you may inquire if these pants are durable, weather resistant, comfortable, warm, and flexible. Also, be sure where you are going for mountaineering. You may also make a choice between the hard shell and soft shell fabric. Lastly, whichever mountaineering pant you choose, be sure to select one that keeps you warm and safe in the mountains.